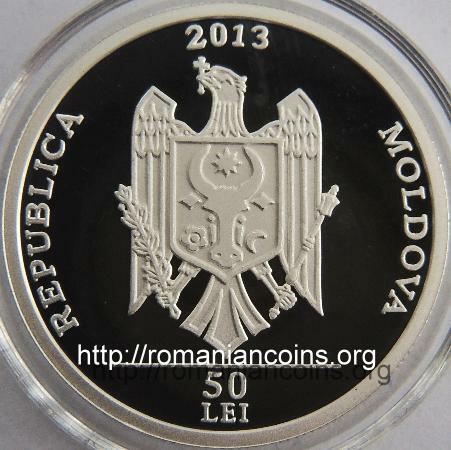 year 2013, circular inscription REPUBLICA MOLDOVA meaning "REPUBLIC OF MOLDAVIA" and the coat of arms of the Republic of Moldavia, in exergue horizontal line and denomination "50 LEI" an image of the cave monastery of Ţîpova, three leafless trees to the left, inscription "MĂNĂSTIREA ŢIPOVA" meaning "ŢÎPOVA MONASTERY"
The coin belongs to Holidays, culture, traditions series. 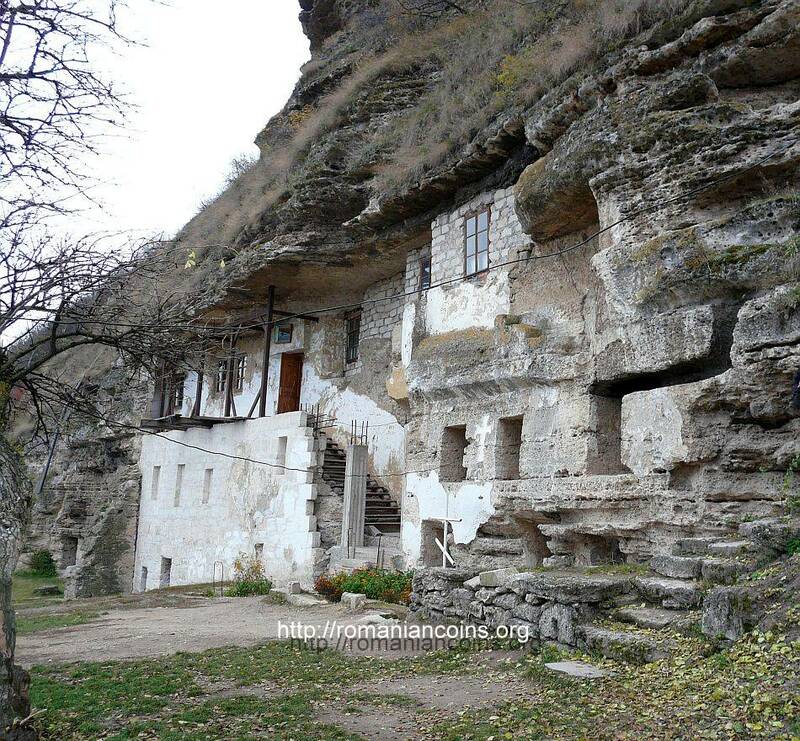 The monastery of Ţîpova is a cave (rupestral) monastery on the right bank of Nistru River, 42 kilometers south of the city of Rezina. 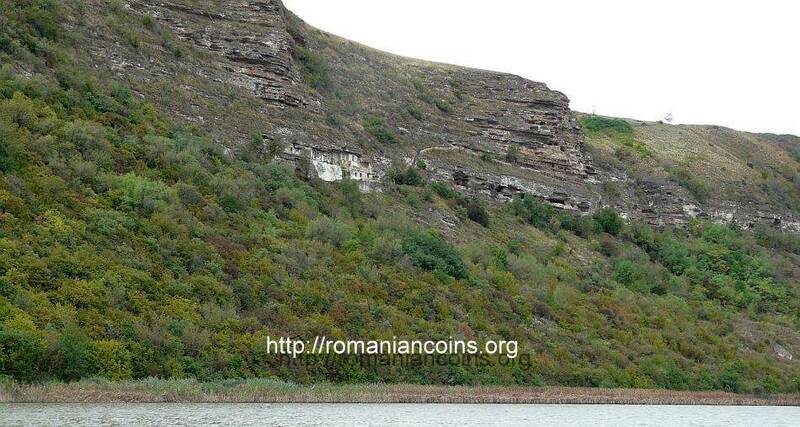 It was dug on the high, steep rocky shore, 100 meters higher than the level of River Nistru. 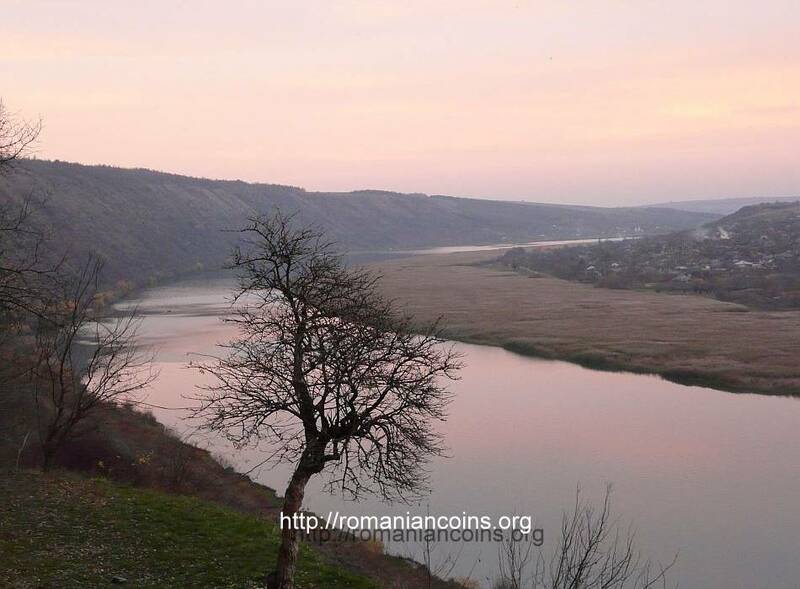 Close to it lies the village of Ţîpova and a rivulet bearing the same name. The first historical attestation of the village of Ţîpova dates back to 1746. 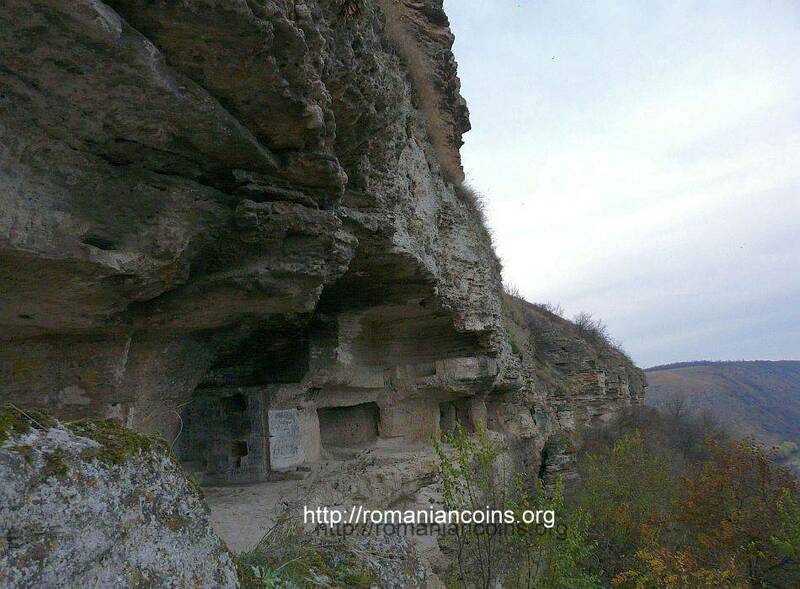 The inscriptions (possibly modern) on the back of some icons found at Ţîpova would suggest an older dating of the monastery, which could be 1666 or even the times of Stephen the Great , . 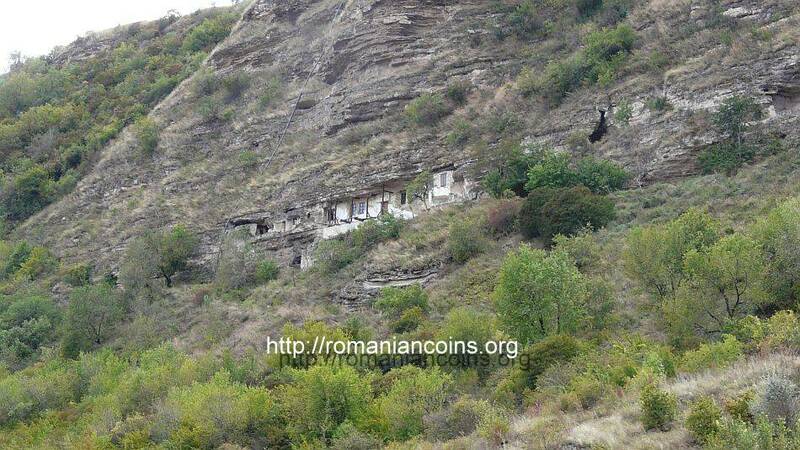 Between 1932 and 1940 the village was named Ştefan cel Mare as courteous consideration to the Moldavian leader. This renaming is a consequence of such an interpreting to an inscription, hinting at the marriage of Stephen the Great there; the icon bearing the inscription was however lost. 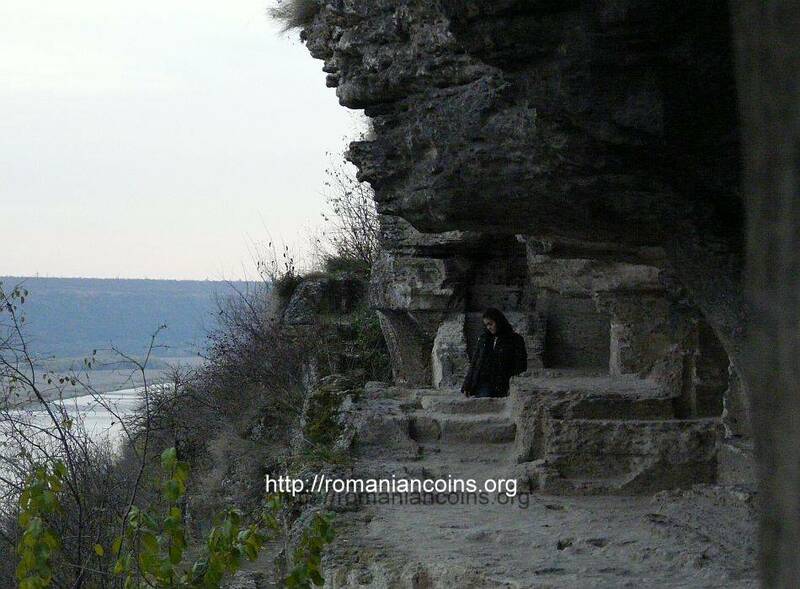 In the 19th century the monastic settlement at Ţîpova was called Skete of Horodişte, after the name of a village nearby . 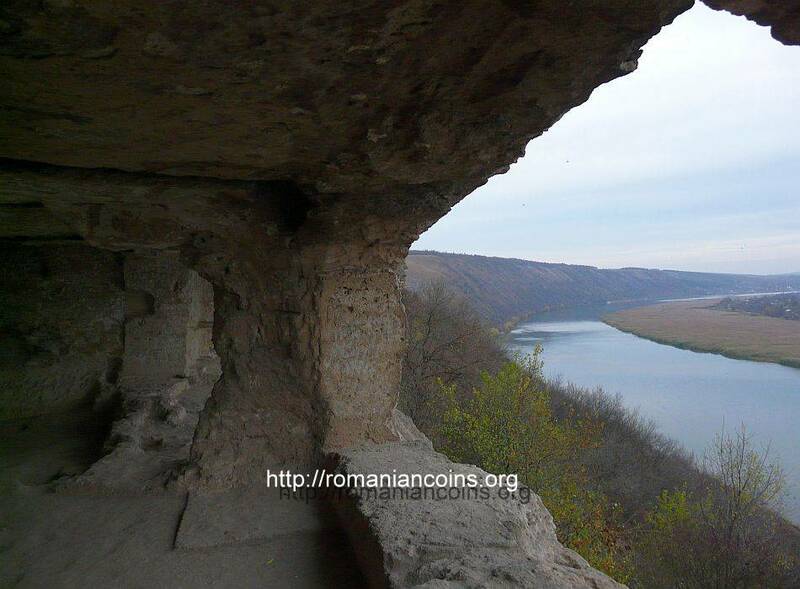 Just like the other cave monastery complexes in Basarabia, all dug into shell limestone, the outer walls of the chambers are generally ruined as combined result of natural erosion and human intervention. 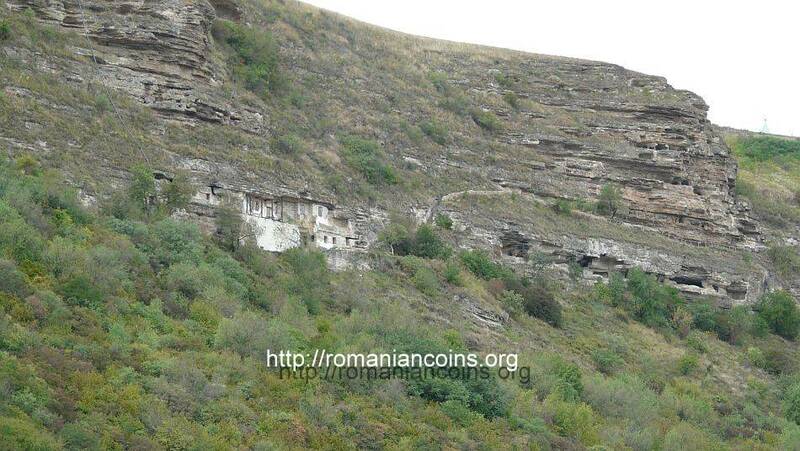 Several layers of rupestral complexes, nowadays collapsed and abandoned, suggest several stages of habitation at Ţîpova. 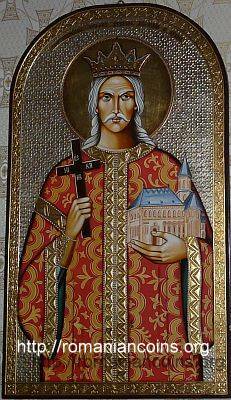 According to , the church Exaltation of the Holy Cross could date back as early as the 11th century, and the church of Saint Nicholas could date from the 14th century. These two churches are today ruined by the passing of time. 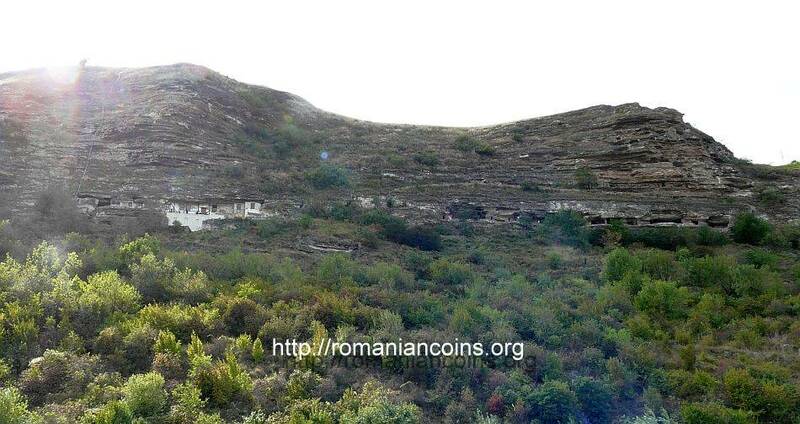 The actual rupestral complex, comprised out of the Dormition church and about 20 cells, was dug out starting with the 17th century, the church having been dated back to 1765  or 1756 . 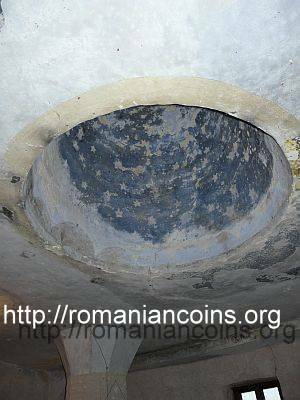 On the ceiling of the church a semispherical vault was dug out, imitating the ceiling of a terrestrial church , . In 1827 the nearby construction of a terrestrial church was begun. 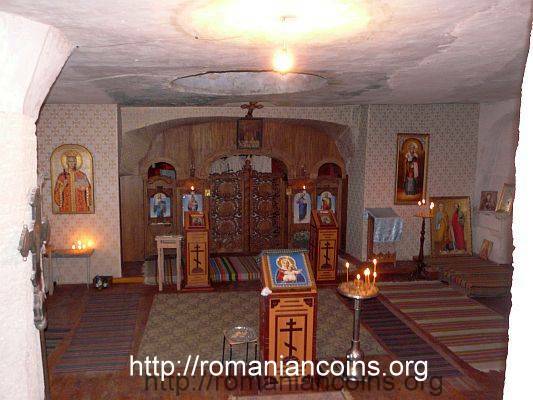 The monastery was shut by the Soviet occupants, the monks being dunned and ousted, the church's belongings wasted away. 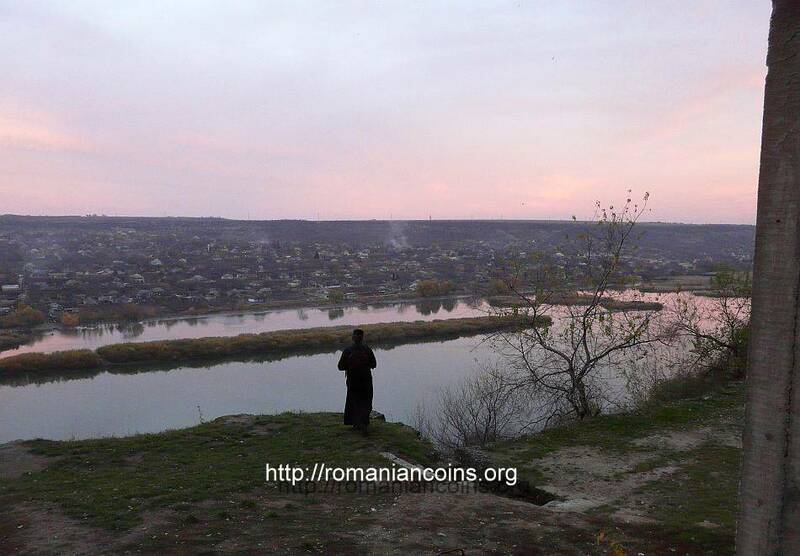 The bells were saved, ending up in the church in the Popencu village, on the other side of River Nistru. 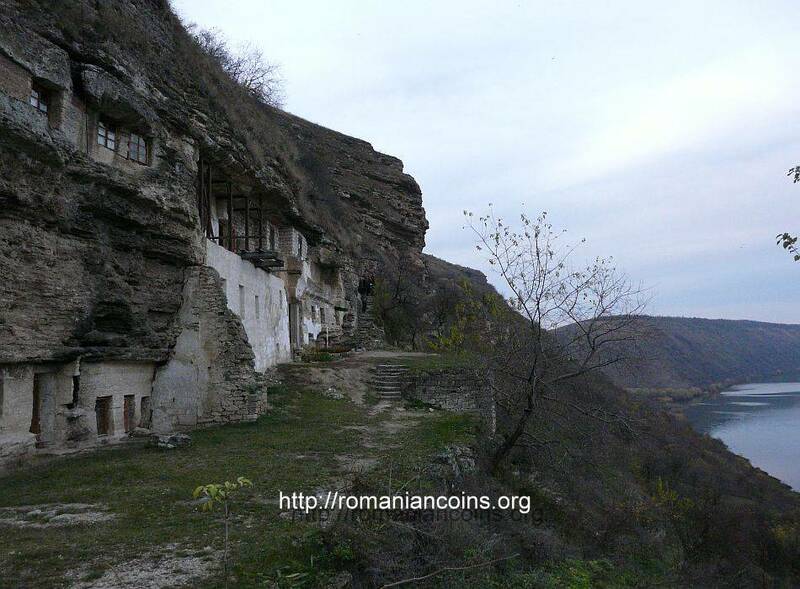 The monastery was reestablished in 1994. 1. 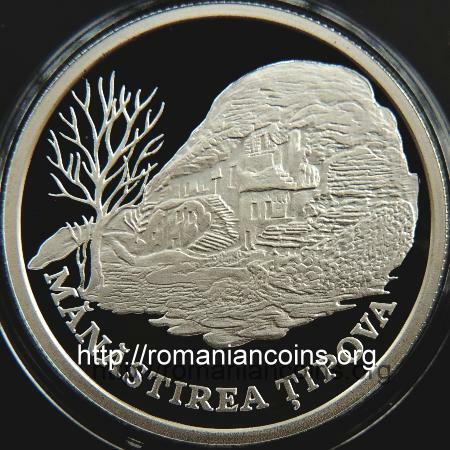 Bârcea D., Românitatea răsăriteană. 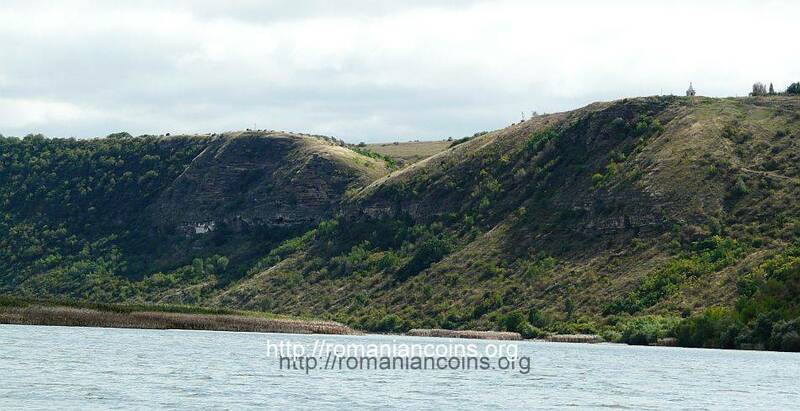 Biserici rupestre din Basarabia. Editura Semne, Bucureşti, 2006. 2. 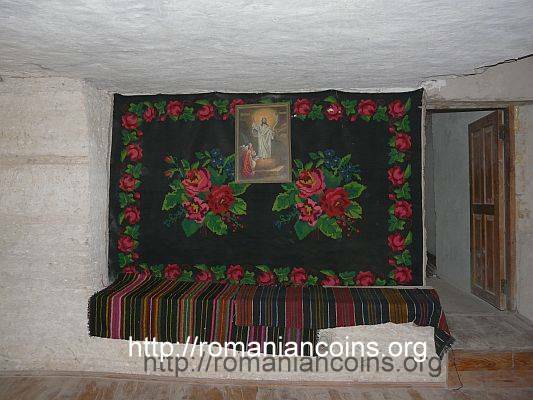 Ghimpu V., Biserici şi mănăstiri medievale în Basarabia. Editura Tyragetia, Chişinău, 2000. 3. Griţcu I., Iftodi Ludmila, Mănăstirea Ţâpova. Chişinău, 2005.